Then it stopped, as if it couldn’t go further. So the man decided to help the butterfly. The butterfly emerged easily, but it had a swollen body and shriveled wings. The man continued to watch it, expecting that any minute the wings would enlarge and expand, enough to support the body. In fact, the butterfly spent the rest of its life crawling around. The restricting cocoon and the struggle required by the butterfly to get through the opening was a way of forcing the fluid from the body into the wings so that it would be ready for flight once that was achieved. We would not be as strong as we could have been and we would never fly. Life’s cruelest hardships are often the powerful driving force that empowers us to emerge from the prison of entrapment—and soar. 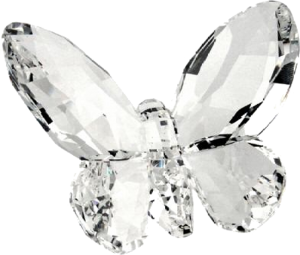 Each client of the Pathways to Independence program is gifted with a personal crystal butterfly upon her graduation—a powerful symbol of the miraculous transformation she has achieved through her own commitment and hard work.